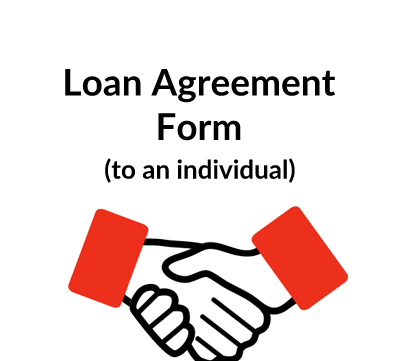 Who can use this Loan Agreement? What is this Loan Agreement for? Interest rate and when interest will be payable. Default – i.e. 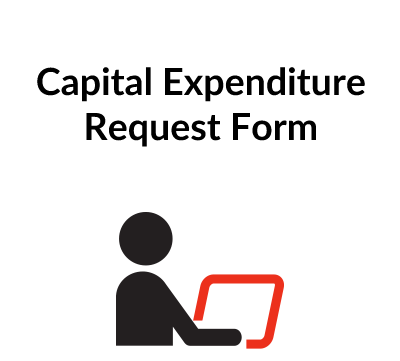 what happens if the borrower does not make a payment of interest or capital on time? ContractStore supplies templates and is not a law firm. But all our templates are written by experienced lawyers – in this case by a commercial solicitor – so we can arrange legal assistance for customers who need special terms in one of our documents or a bespoke template. . For more information see our Legal Services page. 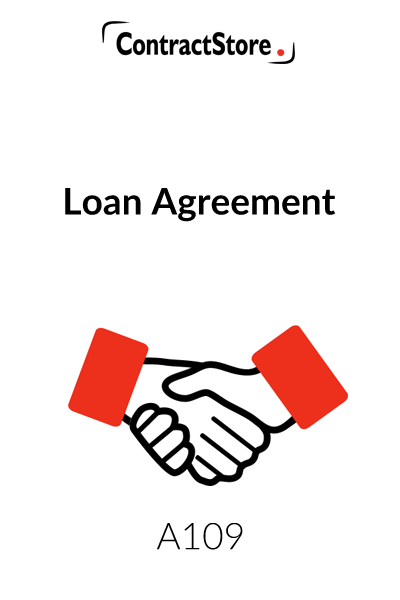 This is a simple Agreement between a Lender, who may be either an individual or a company, and a Borrower that is a limited company, setting out the basic terms on which a loan will be made, the rate of interest and the repayment provisions. 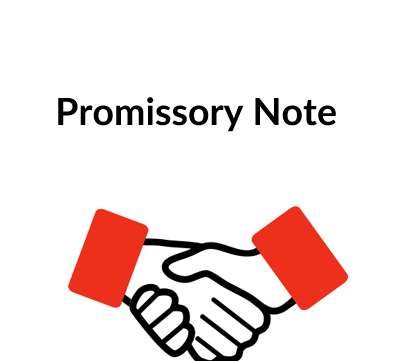 This Agreement does not contain any provisions for the Borrower to give any security for the loan. 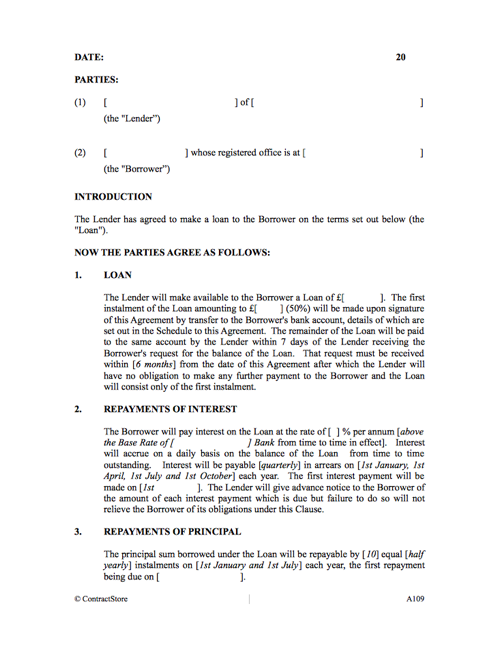 Clause 1 specifies the amount of the loan and provides for the possibility of the loan being drawn down in two instalments. Clause 2 specifies the interest which is payable by the Borrower and the dates upon which interest will be payable. The template suggests every three months but it could be more frequently – e.g. monthly, or less frequently – e.g. yearly. This clause also provides for the Lender to notify the Borrower of the amount of interest which is payable on each interest payment date. Clause 3 specifies the period within which the loan must be repaid and the amount and date of each repayment. Clause 4 allows for the loan to be repaid early without any penalty. Clause 5 makes it clear that payment will be made directly to the Lender’s bank account, details of which will be set out in the Schedule to the Agreement. It also deals with the possibility of a payment becoming due on a date when banks are not open for business. The warranties set out in this clause give some relatively basic protection to the Lender in the form of warranties relating to the financial affairs and indebtedness of the Borrower. It is sensible for a Lender to require financial information to be supplied by the Borrower on a regular basis so that he can see how the Borrower’s business is faring. Clause 7.3 gives the Lender the right to call for any information which he might need. Clause 8 restricts the Borrower from certain dealings which might prejudice the Lender’s position. This Agreement mentions only three matters, but some lenders might consider the list could usefully be extended. Clause 9 allows the Lender to call in the outstanding loan in certain circumstances. Again, the list of circumstances is very short and could be extended. Clause 10 allows the Lender to terminate the agreement and demand immediate payment of the loan if it considers that a change in ownership/shareholdings might prejudice its rights under the Agreement (e.g. by lowering the credit worthiness of the Borrower). Clause 11 is a fairly standard clause preventing the Borrower from assigning its rights under the Agreement. Clause 12 gives the Lender the ability to waive a breach without setting a precedent. So, failure by the Lender to pursue a late payment does not set a precedent so as to prevent him from doing so later. This is a standard clause dealing with the procedures for service of notices. Clause 14 specifies the governing law and the courts which will have jurisdiction if there is a dispute. It should be mentioned here that it is very unusual to have an arbitration clause in a loan agreement: the only sensible place for a lender to seek recovery of an outstanding debt is the courts. The courts have the powers of enforcement which may be needed.